World Forum “Communication on Top” 2011 focused on Reputation Management, eventually proving to be well worth visiting, highly beneficial and really enjoyable itself! The 2nd edition of the annual event got qualified by many as reaching “above all expectations” - thanks to the combined efforts and strenuous work of each member of the Top Com team, the valuable contribution of the Forum Committee, and all partners and participants’ active support! Forum 2011 summoned communication professionals from over 20 countries on 5 continents (Europe, Africa, Asia, North America, and for the first time - from Latin America) - Russia, Bulgaria, Switzerland, Portugal, Germany, Belgium, UK, USA, UAE, Peru, Mexico, Oman, Saudi Arabia, Lithuania, Kazakhstan, Ukraine, Belarus, France, Italy, and Canada. Davos Congress Centre again turned into a platform for open dialogue, uniting different cultures, religions, social networks, and various professional areas. Successful communication practices and best strategies were shared by global leaders in various business sectors (EDELMAN, DELL, CERN, E.ON, ENEL, VTB-24, Van Marcke, i-JET), and high-rank institutions - EU Council, the Dubai Government, and the Government of Germany. Over 80 professionals from 15 larger or smaller companies, 30 consultancies, and 5 large associations and institutions witnessed the captivating spirit of Davos! The agenda offered an outstanding debate (moderated by Maxim Behar, CEO of M3 Communications, Bulgaria) between two communication gurus – Paul Holmes (TheHolmesReport.com) and Marshall Sponder (WebMetricsGuru.com), 20 presentations with many practical examples, selected case studies in IR (ENEL, presented by one of the the Executive Directors in its Media Department - Vittorio Alessio) and external communications (EuropArea - presented by the Managing Director Louis Schorlemer), a couple of general overviews (one on WEF - presented by Rui Martins, Corporate Communication and Public Affairs Director at Dianova, Portugal), and a vast number of Q&A panel sessions with thought-provoking comments and business-oriented conclusions. A memorable “blind” discussion (moderated by Jolyon Kimble, Associate Director at APCO Worldwide, Belgium) focused on the role of new media in the current situation in Egypt and the Middle East. Two experts from this region shared their visions of the upcoming changes towards democracy: Nicholas Labouschagne, strategic adviser for the Dubai Government, and Sultan Al Bazie, CEO of Attariq Communications - Saudi Arabia, Chair of IPRA Gulf Chapter. Among the top-rated presentations were those of Gary Grates , President and Managing Director of EDELMAN Change & Employee, James Gillies, Head of Communications at CERN – the European Organization for Nuclear Research, Philippe Borremans, Chief Social Media Officer at Van Marcke Group, Kerry Bridge, Global Digital Communications Manager at DELL Public Sector, Mohamed Al Ayed, President and CEO of TRACCS, Ansgar Thiessen, Board Member at the Swiss Association for Crisis Communication, Sultan Al Bazie, CEO of Attariq Communications - Saudi Arabia, Chair of IPRA Gulf Chapter, and Marshall Sponder, WebMetricsGuru.com. 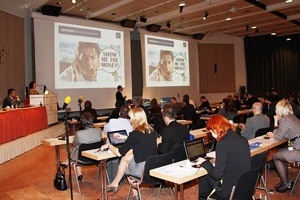 See all presentations at: http://www.forumdavos.com/presentations/2011 (please copy and paste the link directly in a new browser slot). “For teenagers the border between real and virtual is so blurred that a real car equals the one bought online.” - Alexey Kostarev, i-Jet Media. This year the Forum also hosted the inauguration of its C4F awards ceremony and Gala Dinner. The award is to be given annually to outstanding communication professionals with major influence on the improvement of communications and effective contribution to the new trends in the development of the communication industry. Congratulations to the worthy winners selected by the Forum Committee within the 4 award categories! “Relations of the Future” was awarded to James Gillies (Head of Communication at CERN), for providing best communication strategy for the promotion of the Large Hadron Collider: www.forumdavos.com/awards! The internet audience had the opportunity to watch this all online via Live-stream! Our sponsors, hosts, partners, and contributors (partners/2011) supported the event and helped us spreading it worldwide. Special gratitude to our Platinum Sponsor from Russia - IES holding, who helped us realize the event! Special thanks also to the Forum Committee, who continuously advised on the potential content, the agenda, the recommendations for speakers, and helped with the popularization of the initiative! We thank you all once again for the time, the efforts and the valuable contribution, without which the forum could hardly achieve its goal! All photos, videos, interviews will be available on the forum website. "A very interesting event, though I did cop out on using my tiny bit of Russian." "Thank you very much for the Forum as an excellent platform for meeting new people and networking! Everything was great in terms of logistics, timing, catering."